The perioperative care of the bariatric surgical patient is provided by the multidisciplinary bariatric team with patient safety being paramount. Patients should be adequately assessed and risk factors identified and managed prior to surgery to optimize patient outcomes. Such care can be divided into preoperative, perioperative and immediate postoperative care, up until the patient is discharged from the bariatric unit. Apart from addressing the medical and psychological issues of the patients,’ the in-hospital experience of the patients should also be taken care of. Units should have adequate equipment and fully trained staff to look after the morbidly obese, with enough space to care for and ensure patient dignity and respect. Good communication between the surgical, medical, allied health professional and primary care is essential at this time of the patients’ pathway to promote the high standard of care that bariatric surgery patients need. This chapter deals with these issues and is illustrated with the practical aspects of care that is offered at the author’s place of work. NHS commissioning board clinical reference group for severe and complex obesity. 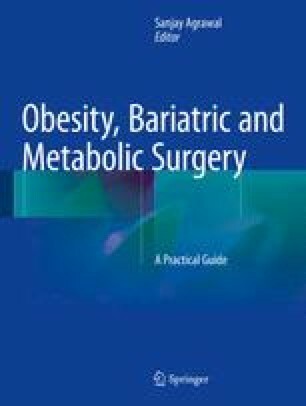 Clinical commissioning policy: complex and specialized obesity surgery. April 2013. Reference: NHSCB/A05/P/a. Available online at: http://www.england.nhs.uk/wp-content/uploads/2013/04/a05-p-a.pdf.